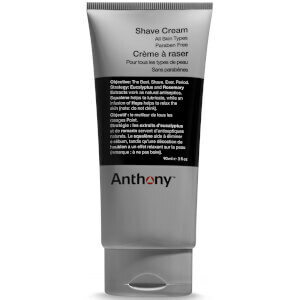 Get a close, clean shave with Shave Cream from Anthony. The rich, easy to apply formula provides a luxurious lather which softens beard hairs, allowing for an incredibly close shave. The cream is infused with natural plant extracts, working as natural antiseptics and helping to lift beard hairs, preventing irritation, razor bumps and burn. The Benzocaine free formula cools on contact and prevents skin numbness making it impossible to over-shave. Apply an even thin layer onto wet face with your hand (or a brush). When using a brush, apply a small amount to the tip of the brush, wet and apply to the skin in a circular motion, to lift facial hair.